The following fill in the blanks come from UK-based alternative rock band, Omaha. This 5-piece from Leicester formed back in 2012. They recently got signed by We Are Triumphant Records and just revealed a music video for their single “Devilish Acts.” The rest of the Chapters EP will be released this January. In anticipation of Chapters, I sent over some fill in the blanks to learn more about the band and their new record. For a sneak peek, be sure to check out their new music video for “Devilish Acts” below. The meaning/story behind the name Omaha is…. Before the band started back in 2012, Jake had the idea of starting a band named Omaha, based off the beach from World War II. It was the first name put forward and we’ve stuck with it ever since. We met each other… Jack and Ben met Jake in 2012 when the band first formed, taking a whim on a new potential band. 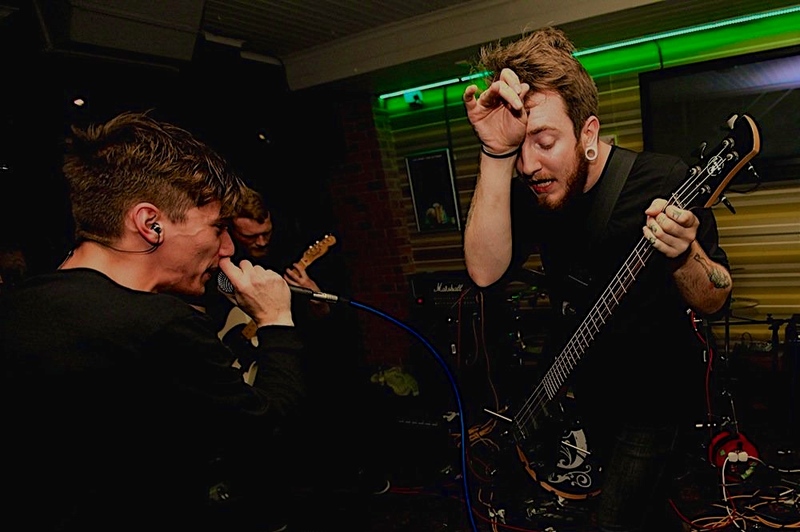 Arron was old friends with Jack, and when a previous project of his fell through, he joined the band in 2014 when the bassist position became open. When looking for producers to record the new EP, the band met Freddie for the first time. Freddie ended up mixing and mastering the EP, and after a while, joined the band as the final member. The pickiest eater in the band is….We don’t have a particularly picky eater. I guess the answer would be Ben, Jake and Arron, as all three are vegetarians, and some people would consider that to be picky. The most OCD member is…. Again, we don’t have a particularly OCD member. Ben would be an option as he is adamant on having the volume on his car radio on multiples of five. For fun we like to….As a band, we like to hang out, go out for drinks, play video games (mainly Fifa), and write music to have fun. We’re currently listening to…. Some of the albums that we have been listening to recently include: Asymmetry by Mallory Knox, White Noise by PVRIS, Dear Youth by The Ghost Inside, and Versus by Emarosa. The first song we wrote together was…. “Devilish Acts,” which is also the first single from our new EP. The member(s) who writes most of our songs is…. Instrumentally, songs are written mostly by Ben, with some help from Jake. Jack then helps to finish songs off with lyrics/melodies. With the new line-up, we are looking forward to writing music as a whole, with input from every member. Chapters was recorded in….We recorded the majority of the EP in the summer of 2014, starting late July and finishing off a week or two into August, and made the last few touches to the EP between September and October. It [Chapters] is different from our previous releases because…. With Chapters, we took a new approach to writing music. We decided to write music that we really wanted to write, and also enjoy, rather than writing what we thought we should. This created a more mature, unique sound which we believe is a big step up from our previous releases. Something we want you to remember while listening to our music is…. We put a lot of effort into writing and making this EP into something that we could be proud of. We’re very happy with how it has come out, and we really hope that everyone else can enjoy it in the same way that we do. In the next six months…. We are releasing our new EP ‘Chapters’ on January 20th, and there will be a music video coming out near to the release to help support it. After that, we will be looking to play as many shows as we can to spread our new music, with a couple of tours in the works as well. This entry was posted in Fill In The Blank, Interviews, Uncategorized and tagged band interview, Chapters, Chapters EP, Devilish Acts, featured artist, fill in the blanks, interview, Omaha, Omaha band, Omaha interview, Omaha UK, Omaha UK band, recommended artist. Bookmark the permalink.